Born in Antwerp, Calvaert (1540-1619) traveled over the Alps while still very young; with stops in Bologna and Rome he came to adopt a rich, colourful Mannerist style heavily influenced by Federico Barocci. 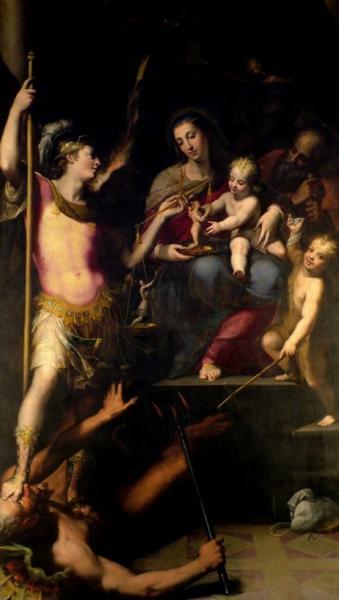 Returning to Bologna, Calvaert founded an academy in 1572 that achieved success—until the Carracci founded theirs and stole away many of his students, including Domenichino and Guido Reni. Calvaert was always popular in Bologna, though for many elsewhere his continued loyalty to Mannerism seemed a bit out of date. He never left the city again, and he is buried in Santa Maria dei Servi. He is well represented in the Pinacoteca Nazionale, and other works can be seen in Santi Gregorio e Siro, San Petronio, and San Giacomo Maggiore.